What Is Considered A Bad Credit Score For A Loan? Sometimes we find ourselves in situations where extra cash is needed. 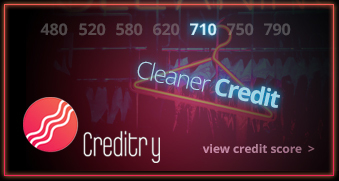 However our credit may not be the most attractive in terms of scores. This can prohibit our loan ability or limit our loan options. A bad credit score usually refers to anything at or below a 550 score. Most traditional financial entities use this score as the at or below for bad credit. To most creditors, they find these scores to be a high risk for their loan. However, there are options out there if your credit score falls into this category. A bad credit score comes from having several missed or late payments reflecting on your credit. If you have recently found yourself getting behind on your payments or repeatedly paying late, you can assume that this behavior is going to be reflected on your credit report. This reported activity will have a negative impact on your credit. For those of us looking for a loan with bad credit, this can impact our approval with applications not only for loans, but also credit cards and even vehicle purchases. Because it can affect these different types of necessities, it can also affect personal loans from traditional lenders. Can You Get A Loan with A Credit Score Under 550? 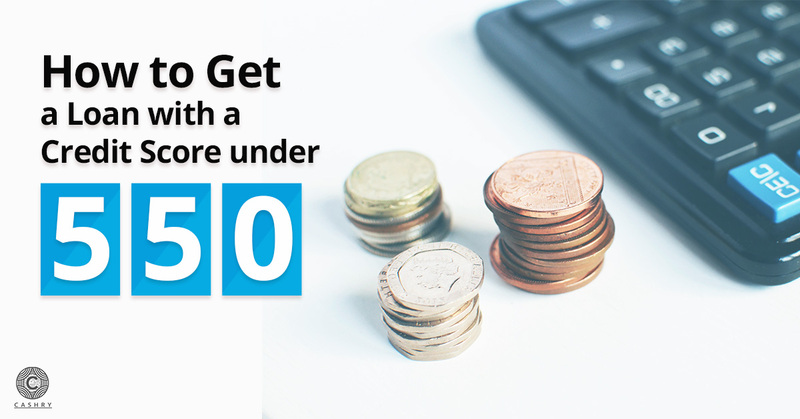 Although traditional financial lenders do not provide loans for scores under 550, there are still options for how to get a loan with a credit score under 550. If you are looking for different types of loans with a bad credit score, you can expect these options to offer a much higher interest rate than your bank or credit union. Due to your credit, you are considered high risk. Quite frankly, you only have limited options when you attempt to get a loan with a credit score under 550. No matter where you attempt to get a loan with a credit score under 550. You can definitely expect the interest rate to be the worst and the highest on the market. Interest rates are designed by risk and credibility. Someone with a credit score at or below 550 is considered a high-risk loan for any financial lender. Whether they plan to approve you or not. Unfortunately, there is little room for negotiating when it comes to the high interest. Indeed, this standard for bad credit is assumed across most institutions, and with such a score, there is no leverage to negotiate. You may have to consider the payments due to the high interest rate and the amount that you are considering borrowing to determine if the payments are affordable on your budget. If you are attempting to get a loan with a credit score under 550, you may be presented with a term limit on your loan. While you were expecting five years for repayment, you have been pre-approved for only two years or twenty-four months. This is a big difference because the time frame will cause the anticipated payments to increase and cause financial strains within your budget. This stipulation in addition to the high-interest rate could affect the amount of the loan that you can afford. Another disadvantage for those of us with bad credit attempting to get a loan is the limit of the amount we can borrow. You may need two thousand dollars to cover a debt, but you may only be approved for one thousand. This can be difficult when you attempt to get a loan with a credit score under 550. Because the interest rate is higher and the repayment time frame is much shorter than originally expected. We often find ourselves rethinking our loan requirements and determining if the loan will be enough. Since your loan amount may be at a higher interest rate than you were anticipating, a shorter repayment term, and a limited loan amount, you may need to secure a co-signer loan. This is someone with much better credit who is willing to claim responsibility for the loan should you decide to not meet the agreed upon terms. They will be held to the same responsibility as you are. Their credit will be affected adversely should you decide to not make the payments. A co-signer with fair or good credit will give you that room for negotiating. At least when it comes to high interest. He will help you with the amount you are attempting to borrow. How to Get A Loan With Bad Credit (Under 550)? If you are wondering how to get a loan with bad credit under 550, you can seek out the internet for these short-term loan lenders and fast payday loans lenders. You can use an online loan lender finder service that will give you options of the short-term loan options available, as well as any fast payday loans. You will be able to search and view these lenders based upon their collateral requirement and their interest rates. There are cash loans available at private finance lenders that can be located either online or within your community. Many of these lenders require some form of collateral for their approval process. Collateral includes placing any items up to secure the loan. It is just in case you do not make the agreed upon payments. Then the company would need to come and collect your items in place of cash. These collateral items include everything from vehicles to electronic devices that are itemized on your application, including any and all serial numbers. You are able to take the title of your car to the office and leave with cash or check shortly after your application has been processed. These loans are accompanied by high interest rates that can triple that of a bank or credit union. There are also short-term loans available for bad credit. These loans can vary in either secure or unsecured loans. It depends on how bad your credit score is and what you qualify for following your application. These loans are also equipped with high-interest rates and even higher rates for the loans that qualify as unsecured and do not require any collateral. Unlike the traditional loans a person with fair or good credit has access to, these loans have a much shorter term than the average loan. This not only promotes higher payments but also limits the amount of loan you can receive. If you are looking for a specific amount to borrow, you may have to shop around through several lenders. Or you may have to reconsider the loan amount. For those weeks that you have an emergency arise and it is not quite a payday, there is always fast payday loans available. These loans are often some of the smaller options available and you can receive up to the amount of your average paycheck. They will need proof of steady income. Like other lenders that offer ways to get a loan with a credit score under 550, you will be subjected to high interest. Also, these loans require you to some of the shortest terms. They often require repayment within one or two pay periods. Pros and Cons Of Getting A Loan With A Credit Score Under 550? The pros when you get a loan with a credit score under 550 is the access to fixed terms on your loan. No matter what you agree to. No matter how high the interest, how short or long the term of repayment. Whatever you agree to with these lenders is fixed. Fixed terms promote healthy budgeting and help you with repayment on your loan. Before you sign and agree to the loan terms, you have the ability to discuss and make any changes that you are not comfortable with. There are no fluctuating rates that can change at the turn of another annual year on the loan. There are many things to consider when getting a loan with bad credit and some of them are positive. Another pro to these types of loans is the options of lenders available. If you find that you are not comfortable with the terms of a lender, their operation practices, or just want to continue shopping around, you can. This flexibility is not something that is offered with traditional lending for personal loans. While interest rates and repayment terms may be high and short, they are competitive. Why? Because there are numerous lender options available. This allows you to negotiate terms. Especially if your credit score is on the closer end to the 550. With these loans, you have the ability to consolidate your debt and have only one payment. While the interest may be high, you are only making a single monthly payment. It makes it affordable and budget friendly for you. If you find yourself struggling to meet payment due dates regularly, then it may be easier to consolidate that debt and have only a single payment. This will help you keep up with what you owe and build your credit score up to a fair or good rated score. Unlike other personal loans, if you want to get a loan with a credit score under 550, you can expect increased interest rates from the lenders offering you a loan. While you may have a variety of lenders to choose your loan from, you can expect that all of them will be coming with a high interest rate. At least compared to the rates offered to those with fair or good credit scores. If you have good or fair credit, you can often expect to get approved for exactly the amount you need. Or even more if your credit score is that positive. When you try to get a loan with a credit score under 550, you may be entitled to what you ask for. However, that is only if the limit is around five thousand dollars. If you are expecting more than that amount, you may need to reconsider your loan. You can also consider approaching a friend or family member with good credit to be your co-signer. If you are looking for five years to pay back your loan, which is comparable to a monthly vehicle payment, you can look again. In most cases, you may receive three years to pay back your loan. Expect these terms to be laid out in months, as to make the loan appear longer. If you are contracted to pay the loan back in thirty-six months, you only have three years to complete the loan payments. You need to make sure that you really understand the terms of your loan and what the repayment time is being offered. Bad Credit Loans Higher Monthly Payments? If you are trying to get a loan with a credit score under 550, you may find yourself finding loan offers, but those offers include high monthly payments. Sometimes these payments can make us feel like we cannot afford them, and we begin to rethink our need for the loan. For cash loans bad credit, applicants can receive lower monthly payments by first considering the loan options with the longer repayment options. There are some online lenders who give their applicants the flexibility to determine how long they want to schedule their loan repayment for and then approve it. These lenders are still offering high interest rates on their loans, but because they are spread out further in repayment, applicants are able to comfortably borrow from the lender. How Can I Get My Credit Score Up Fast? Now that you know your FICO score is not the most desirable, I am sure you are seeking the best ways to boost this score…and fast. Below are three tips that will help improve your credit score in under a year. They will make you more desirable to lenders. First, you need to review your outstanding debt. For any debts that can be paid in one or two payments, consider eliminating them immediately. Once you have eliminated as much debt as possible, you need to consider a consolidation plan. The aim is to get a single monthly payment after it pays off the accounts associated with the outstanding debt. Your debt-to-income ratio will be less. That will positively impact your credit score. If you have credit cards, you should make sure that you are carrying only a minimum balance on them. If they are closed to being maxed out, you will need to pay them down. Once they are paid down, use no more than thirty percent a month on each card. Pay the balance in full each month. Credit scores are negatively impacted when credit card debt becomes too excessive. Keeping it low will increase your credit score. Get your payments on your debt current. If you are behind on any debt, pay what is owed and get your payments current and up-to-date. Once you have done this, you need to make sure that you keep making your payments on time. A perfect payment history boosts credit scores after just a few months. Where Can I Find A Loan with Bad Credit? If you are trying to get a loan with a credit score under 550, there is still hope that you can get a loan. Whether you are seeking a local lender or searching online. Your options and types of loans vary based upon the type of loan and the amount you need. If you need a smaller amount, you have the option of fast payday loans or short-term loans with a bad credit approval option. If you have the luxury of a co-signer with good credit, you may have access to unsecured personal loans. Even if your credit is considered bad credit, there are still loan options available for you.